JOHN WHITAKER AND LORD OF ARABIA 3rd IN THE 1.50 CLASS AT THE 3* INTERNATIONAL SHOW IN HANNOVER GERMANY 19/10/13. 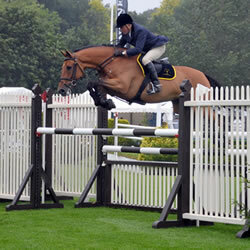 JOHN WHITAKER AND LORD OF ARABIA 2nd IN THE 1.45 AT THE 3* INTERNATIONAL SHOW IN HANNOVER Germany . Well done to John Whitaker and Lord of Arabia 3rd in the 1.40 class on Thursday at The CSIO 5* International Horse Show in Gijon, Spain. John Whitaker and Lord of Arabia 3rd in the Grand Prix in Munster, Germany 21/07/13.